Hunter wants KGB agent Lubin (Garfield Morgan) picked up. He possesses a list of names that would prove incredibly damaging to the Section if he were able to deliver them to his masters. And since Hunter knows that Lubin hasn’t had the chance to communicate with them yet, speed is of the essence. But Lubin surrenders himself to the police. He faces a lengthy spell in prison, but Hunter knows exactly why he’s done it (inside prison he’d be out of Hunter’s reach). Hunter has a plan though – Lubin will expect to be broken out by the KGB, so he plans to arrange for Callan to spring him and then kill him. Breakout is more of a straightforward action story than many episodes of Callan, but though it lacks the depth of characterisation that we usually see, it still has plenty of interest – not least for the central role played by Lonely. In Where Else Could I Go? we saw Callan stand bail for Lonely. Now, Lonely finally faces trial for his numerous petty crimes. As ever, Russell Hunter is a pleasure to watch – even when he has no dialogue he’s capable of expressing so many emotions. This is highlighted when the judge comments that Lonely’s crimes were carried out with “great expertise ” (a pleased expression plays across his face) but “little intelligence” (which instantly changes to downcast). When he’s sentenced to six months imprisonment for each of the twenty-five offences (to run concurrently) he displays a whole range of shocked emotions, especially when he sees Callan laughing. Eventually he understands that he only has to serve six months instead of twelve and a half years, but it’s clear that it doesn’t quite sink in (as he still asks Callan for reassurance later on). If there’s a major flaw in Breakout, then it’s the idea that Lubin is untouchable in prison. It’s hard to believe that Hunter lacks the ability to transfer him and it’s even harder to accept that he couldn’t pull some strings to infiltrate a man into the prison to eliminate him without having to break him out first. But whilst these possibilities are never discussed, they are able to put a man on the inside – the unfortunate Lonely. Lubin is on remand at Castle View (where Callan once spent “six lovely months”). Lonely is dismayed to hear that he’ll be transferred there – but Callan is delighted, as he tells him that he’ll be able to do a little job for him. Woodward and Hunter shared many lovely two-handed scenes during the four series of Callan and there’s another cracking one here. When Callan tells him that he’s arranging a breakout from Castle View, Lonely’s first response is that he doesn’t mind doing his time. Callan gently tells him that he’s not the person to be sprung – Lubin is. Lonely is dismayed. “I don’t hold with spies. Mr Callan, that man is a traitor to the Queen.” To which Callan ironically mutters “Rule Britannia”! Russell Hunter continues to have good material to work with, especially in the aftermath of the breakout. As Callan enters the cell, he says “good luck, Mr Ca-” before Callan brutally pistol-whips him. This was because Lubin knew Callan’s name (although he didn’t know what he looked like) so it was vital that Callan silenced Lonely before he revealed all. 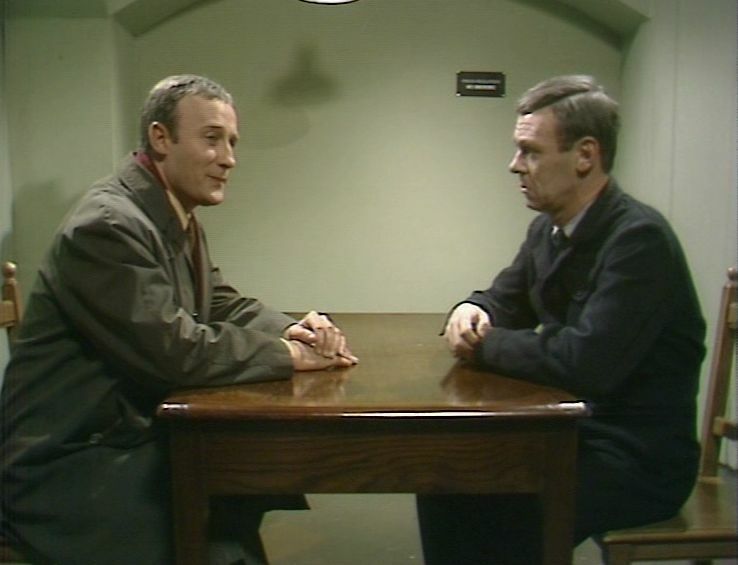 Of course, in the light of this, it was rather silly to put Lonely in his cell (as we later learnt he spent most of his time taking about Callan!). Callan is the leader of the small group tasked to breakout Lubin. Cross and Mellor (Billy Cornelius) are the others. Something we’ve seen over the years is that the Section seems to have very few decent agents and Mellor is the latest, somewhat inept, example. Lubin is easily able to deal with him – but Callan is a different proposition. After a brief gun-battle, Callan finishes him off. Breakout was originally intended to be the final story of the third series and this is reflected in the final scene which sees Hunter and Callan sharing a cup of tea on a cold and deserted beach. Hunter tells him that the KGB now regard him as a top man and so in the future he’s bound to be targeted. This would have lead nicely into the opening story of series four, That’ll be the Day, in which Callan was picked up by the KGB and underwent a harrowing interrogation. Unfortunately, the running order was re-juggled at the last minute – so the rather less satisfying Amos Green Must Live was the last transmitted story of this series. Callan doesn’t learn until late into the episode that Lubin knows his name; by this time Lonely and Lubin have already been cellmates for a while. Wasn’t it established that Callan’s name was on Lubin’s hitlist? And even if it wasn’t, given how clued up the Section are on the opposition’s top agents, it’s a little hard to believe that in turn Lubin would never had heard of Callan. And security is clearly on Callan’s mind early on as he insists that they only use first names when springing Lubin. That also helps to flag up that when Lonely blurts out part of Callan’s surname it’s a catastrophic error. Given how good Russell Hunter was, you can understand why Lonely was used as Lubin’s go-between (it generates some lovely comedy moments) but from a security point of view it makes no sense. Surely the Section would have been better off dropping one of their agents into the prison instead.